Last week my younger sister turned 21. 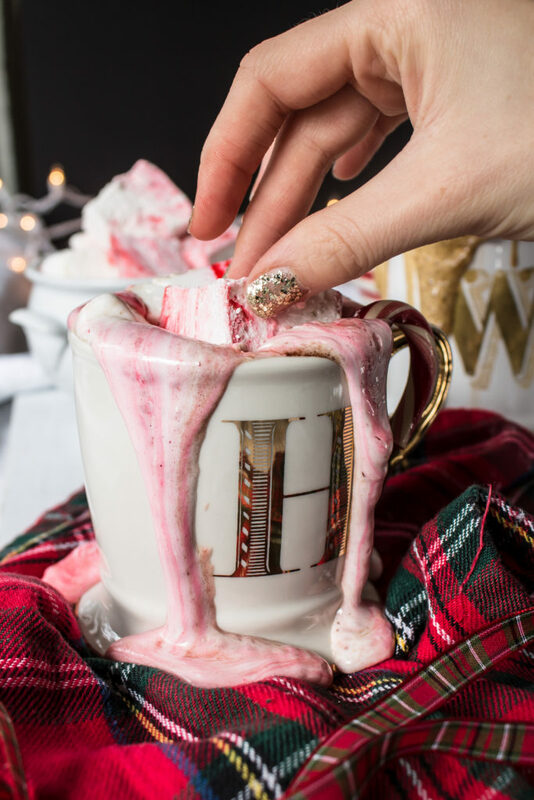 Since it is December and we have to celebrate a 21st birthday properly, I give you homemade adult hot chocolate with peppermint, gingersnap and eggnog marshmallows. Woah. 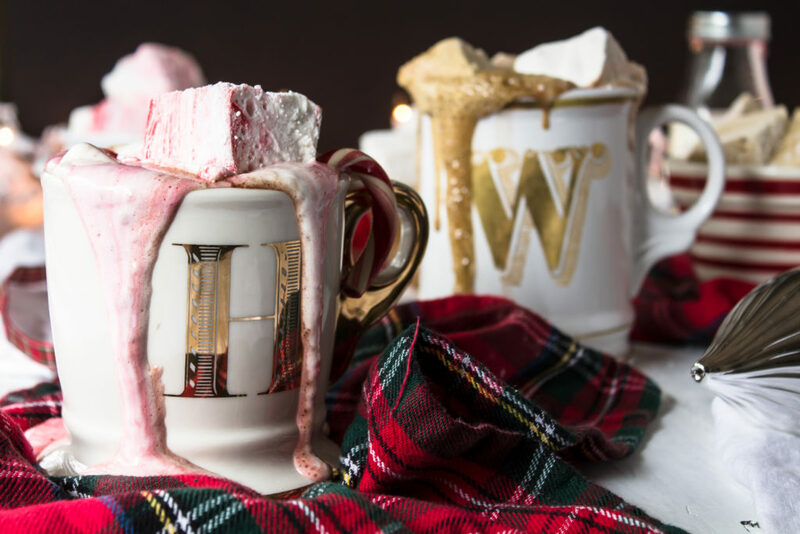 I am usually a tea person, but there is something about December, the crisp air and the festivities that make me crave a good hot chocolate. Add a little booze to celebrate a certain 21st birthday, the holidays, or just winter night, and you can’t go wrong. This hot chocolate is amazing, I just want to dive in. It is rich, deep chocolaty goodness in drink form, perfect for snuggling up next to the tree with a classic Christmas movie. The flavors of the Irish cream and frangelico make the flavor even more complex and comforting. Double, triple, quadruple the batch and it is great for a holiday crowd. The marshmallows create so many delicious combinations. 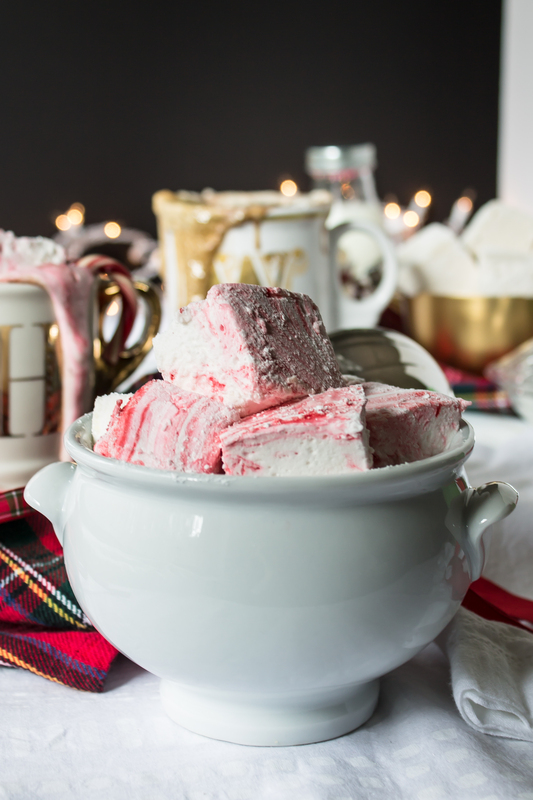 The peppermint marshmallows go really well with the marshmallow vodka hot chocolate, and a touch of peppermint extract, while the eggnog marshmallows are delicious with the frangelico and Irish cream hot chocolate mixture. Gingerbread are good with any of the hot chocolates and really delicious when dipped in melted chocolate. 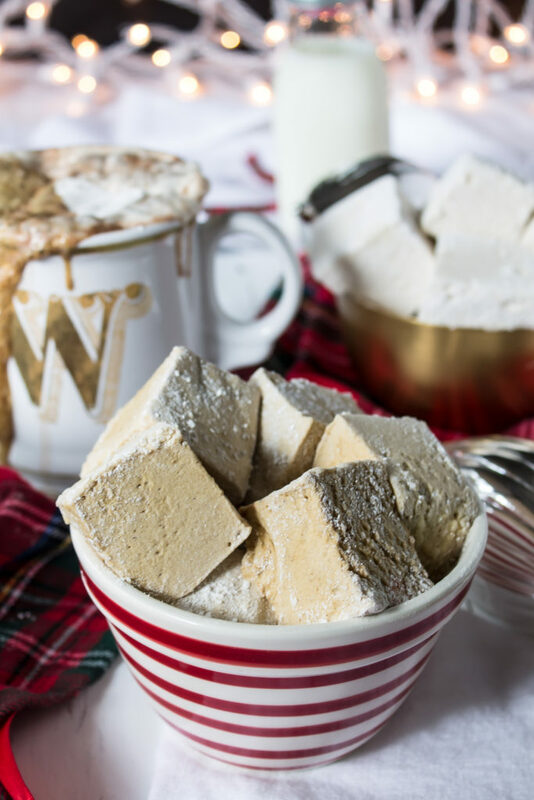 If you are looking for a thoughtful gift for your coworkers, make a batch of one of these marshmallow recipes and package them up with some powdered hot chocolate. 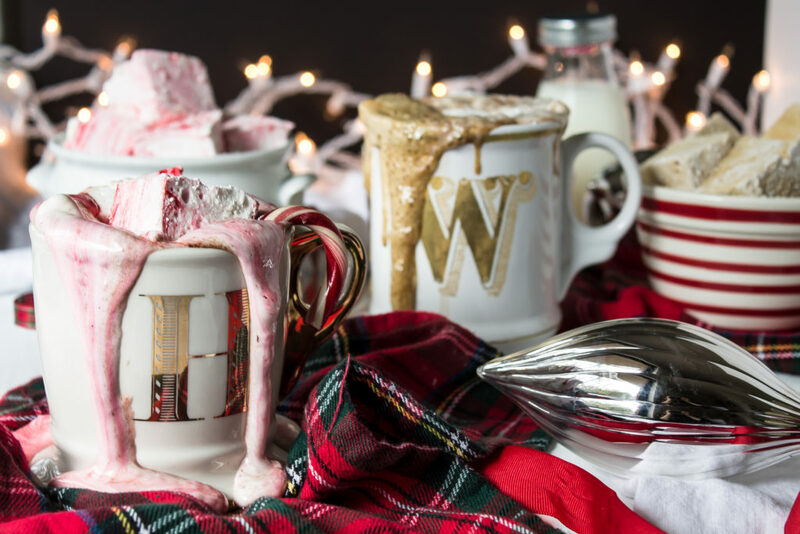 If you gift the combo in a cute mug, they can even use the gift as a 3pm pick-me-up (you know we all need it). The hot chocolate is divine with or without alcohol, but such a great treat when you add it and some huge marshmallows. I can’t wait to enjoy some with my newly legal sister :) Stir it up with a candy cane and enjoy the season! Happy birthday, Lane! “H” mug from here, “W” mug from here, striped bowl from here. In a small saucepan, heat the milk, sugar and vanilla over medium-low heat until the sugar has fully dissolved. Do not let the milk come to a boil. Add the chocolate and stir until almost fully incorporated. Remove the mixture from the heat and continue to stir until all of the chocolate has completely melted. 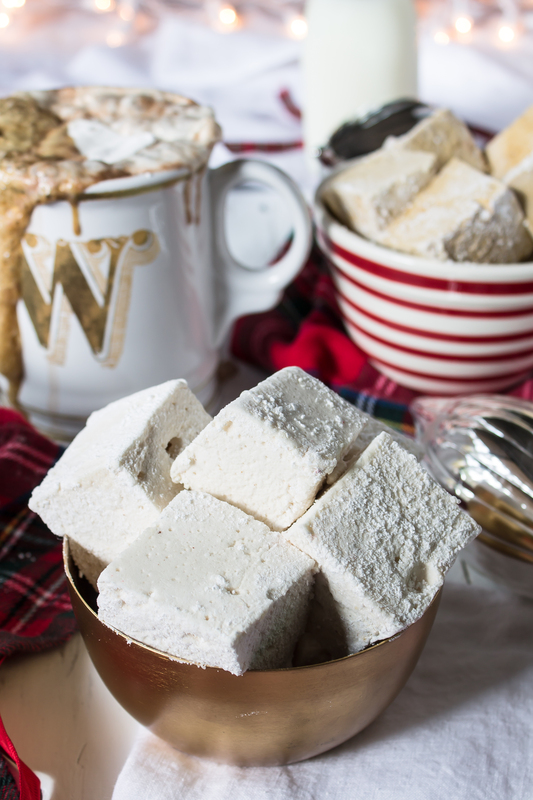 Stir in frangelico, Irish cream and/or marshmallow vodka and serve immediately with marshmallows. Spray an 8×8-inch pan or a casserole dish with nonstick cooking spray and dust with powdered sugar. Set aside. In the bowl of an electric mixer fitted with the whisk attachment, pour ½ cup of the cold water. Sprinkle the gelatin powder over the water and let it sit for about 10 minutes while you prepare the next steps. In a medium saucepan combine the remaining ½ cup of water, the sugar, corn syrup and salt over medium heat. Stir until the sugar dissolves then stop stirring. Increase the heat and bring the mixture to 240 degrees F, using a candy thermometer to check (if you don’t have a candy thermometer you might be able to use a clean meat thermometer). Once the mixture reaches 24o degrees, remove it from the heat. Turn the electric mixer with the gelatin mixture on a low speed and carefully stream the hot sugar mixture into the bowl while the mixer is running. Beware of hot sugar that might splatter if you pour it too quickly or into the whisk! Add the peppermint extract and gradually increase the speed of the mixer to high. Beat on high for about 8-10 minutes, or until white and very fluffy. The mixture should have tripled in volume and will look like marshmallow cream at this point. Spread ⅓ of the marshmallow fluff into your prepared pan, drop a few drops of red food coloring on top of the batter and lightly swirl (not too much, you will stir it again and you want them to have streaks of red rather than be solid pink). Repeat these steps for the next third and again for the final third of marshmallow batter. Dust the tops of the marshmallows with powdered sugar and let rest for 8 hours, or overnight. After they have set, coat a sharp knife with nonstick cooking spray (for easy cutting) and cut the marshmallows into cubes. Roll each marshmallow in a bit of powdered sugar to keep them from sticking to each other. Marshmallows keep well in an airtight container for about 1 week. Follow the instructions for Peppermint Marshmallows, replacing light corn syrup with the ⅓ cup of dark corn syrup and ⅓ cup of molasses in the sugar-syrup-water mixture. Add the vanilla when you would otherwise add the peppermint extract. After about 8 minutes of whipping, add the spices to the fluff and continue to whip for the remaining 2 minutes. This time your fluff will be brown, rather than white. Spread all of the marshmallow fluff into your prepared pan and dust the tops with powdered sugar. Let them rest for 8 hours, or overnight. After they have set, coat a sharp knife with nonstick cooking spray and cut the marshmallows into cubes. Roll each marshmallow in a bit of powdered sugar to keep them from sticking to each other. Marshmallows keep well in an airtight container for about 1 week. While these are similar to the other two marshmallows there are enough ingredient changes that it is easier to detail the recipe again. Here we go! Pour the water into the bowl of an electric mixer fitted with the whisk attachment. Sprinkle the gelatin powder over the water and let it sit for about 10 minutes while you prepare the next steps. In a small saucepan, combine the sugar, eggnog, and maple and corn syrups over medium heat. Stir until the sugar dissolves then stop stirring. Increase the heat and bring the mixture to 240 degrees F, using a candy thermometer to check (if you don’t have a candy thermometer you might be able to use a clean meat thermometer). Once the mixture reaches 24o degrees, remove it from the heat. Turn the electric mixer with the gelatin mixture on a low speed and carefully stream the hot sugar mixture into the bowl while the mixer is running. Beware of hot sugar that might splatter if you pour it too quickly or into the whisk! After about 8 minutes of whisking, add the vanilla and ground nutmeg and whisk for another 2 minutes. Your mixture will be fluffy and white, like marshmallow cream.